Is There a Proper Resolution for Josh Hamilton? By now, we all know Josh Hamilton‘s background and his story. We know how he overcame his demons to become a superstar, only to fall from grace when reports came out in February that he was involved in drugs and alcohol again. Today, there were reports that he filed for divorce from his wife around the same time. Things clearly aren’t going in the right direction for Hamilton, which is quite sad considering how long he was clean and how we, as fans, have seen him grow as a person – in the game and in his faith. The Josh Hamilton story is difficult for many reasons. First and foremost, he needs to get the help that he needs to get his life back on track, whether that’s with counseling for his marriage, for the alcohol, or the drugs, something needs to be done. However, that doesn’t seem to be the biggest concern for the Los Angeles Angels. Now, the two sides are negotiating a way out of this mess, but a trade seems unlikely due to the remaining $90.2 million on Hamilton’s contract between 2015 and 2017. The same reasons that the Angels don’t want him would be the same reasons that others don’t as well, as the 33-year-old outfielder’s skill-set hasn’t been trending upward since he hit free agency after the 2012 season. So, the sad case of the former No.1 overall pick continues. He has been put on public trial with information regarding his relapse that was supposed to be protected by the MLB Joint Drug Prevention and Treatment Program, he could be losing his wife and four daughters, and he could be losing his career. Support him or not, he is a human being who is going through a devastating run. More than protecting the investment, it’s time that the Angels support the man. 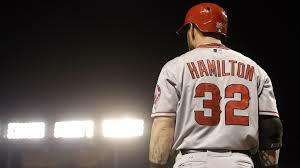 Let the other battles play out behind the scenes and get Josh Hamilton the help that he needs. 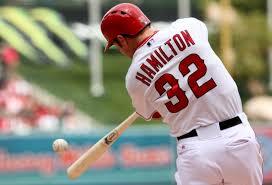 Perhaps the Angels will be rewarded with production once they help Hamilton get his life back in order. Sometimes business and the dollar aren’t as valuable as a soul. This is one of those cases. Freese is entering his age-32 season and has only had one “really good” season, which was 2012. It’s fair to wonder what he actually is, as he appears to be more of a 25 double, 10 home run, 60 RBI-guy than the 25 double, 20 home run, 80 RBI-guy that he was a few years back. Still, Freese has an excellent lineup around him, so he should see plenty of fastballs and be capable of a rebound, but what the ceiling of that rebound is…that’s the big question. A healthy Freese should get to 15 home runs and 75 RBI this season. Is Calhoun capable of more than what he showed in 2014? In just 127 games, Calhoun reached 31 doubles and 17 home runs. Given an entire season of at-bats and entering his age-27 season, Calhoun may be capable of more. With Josh Hamilton‘s status for the season still uncertain, he may even move into a larger, run-producing role. Everyone drools over the opportunity to have Mike Trout on their team, but Calhoun isn’t chopped liver as far as Angels in the outfield. Offseason Overview: The Angels added a solid young starter by acquiring LHP Andrew Heaney from the Dodgers for 2B Howie Kendrick, who was set for free agency after the 2015 season. Heaney doesn’t have top-of-the-rotation stuff, but he could be a nice mid-rotation option for a number of years, and the Angels aren’t known for developing talent, so it was a nice get. To fill the void at second, the Angels acquired Josh Rutledge from the Rockies and Johnny Giavotella from the Royals. Neither are offensive forces, but they’re solid defenders and with Trout and Pujols around, the pressure isn’t on them to produce. If Hamilton misses significant time due to his possible drug suspension, Grant Green, Colin Cowgill, or Matt Joyce, acquired from the Rays in December, could step into larger roles or a platoon situation. The Verdict: Josh Hamilton’s suspension could be a huge issue for the Angels, and I’m betting against PECOTA on this one. The Mariners and the Athletics are in a better position to take the AL West. 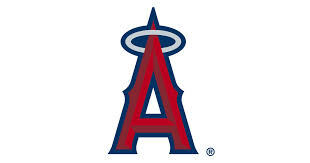 The Angels have plenty of talent, including the best player in baseball, but Mike Trout can’t carry an entire 25-man roster (this isn’t the NBA) and the Hamilton questions, the Pujols aging issue, and the lack of consistency from the remainder of the lineup leaves me thinking that this is an 83 to 85 win team. While that isn’t awful, it won’t be enough in 2015. Long overlooked as an asset in the Rangers order, Moreland appears to be establishing himself as a valuable piece to a Hamilton-less Rangers offense. His left-handed power is needed in the middle of an order that features Adrian Beltre and Nelson Cruz along with switch-hitting DH Lance Berkman. 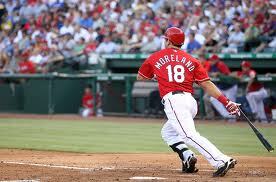 Moreland is 27 and in the midst of his prime. 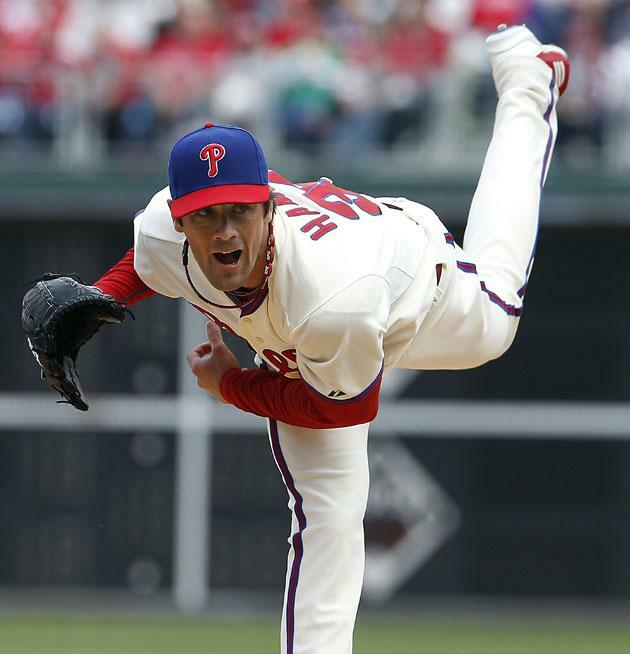 While he does feature a pretty ugly .662 career OPS against left-handed pitching, that number has bumped up to .789 in 2013, so he could still make an interesting career out of playing in Texas. He could certainly turn his recent hot streak into a total breakout. After taking the world by storm last season, Trout started the season slower than some fantasy nerds would have liked, posting a .261/.333/.432 triple slash in the first month of the season. He is picking things up, though, in May, displaying the power and speed that made baseball enthusiasts drool last season. Trout could be on his way to posting numbers like this over the rest of the season. Just imagine what he would be doing if Josh Hamilton was alive and breathing for the Angels…if only he could pitch, the Angels might not look like such an embarrassment. Do you need a sleeper? The Pirates are pretty loaded in the outfield with Andrew McCutchen in center and Starling Marte in left; however, right field is a little…Travis Snider-y. Snider is still just 25 but he is under-performing, again, as the Pirates primary right fielder in 2013. 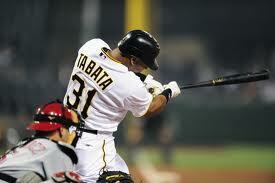 His .267/.347/.356 is very weak and Tabata is heating up with the weather. Tabata, himself just 24, is another floundering former top prospect, but his ability to use the gaps and his speed would make him an asset in real-life and fantasy baseball. Clint Hurdle is an interesting manager, to say the least, so it will be interesting to see if he sticks with a strict platoon or gives Tabata a chance. Mauer continues to prove that his 2009 power surge and MVP season was an anomaly. The Twins are floating around .500 due to Mauer’s production and a whole lot of crappy pitching. If the club was serious about contending, they probably would have done something about Vance Worley and Kevin Correia being their No.1 and No.2 starter prior to the season. With a lot of their talent in their 30’s, including Mauer, the club will be hard pressed for a quick recovery. Oswaldo Arcia has been a nice addition but to even float around being mediocre, Mauer may have to hit .447 over the rest of the 2013 season. He’s hot and he’s a hitting machine. Since this was announced on Monday, which was April 1st (aka April Fool’s Day), it feels like this isn’t happening; however, after it was made official, giving a career .275/.342/.353 line an eight-year, $120 million seems like a nightmare, especially after the club was unwilling to give Josh Hamilton an extension or make the first offer when he hit free agency this winter. 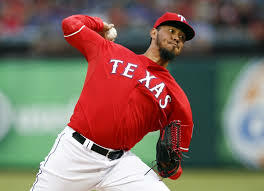 After allowing a player who has averaged a .305/.363/.549 line to leave for their biggest rival, they gave Andrus $15 million per season on an extension, all while Jurickson Profar waits for a position to open up in Texas. Andrus is a fine player. Since arriving in 2009, he has posted a 13.0 WAR, which is sixth among shortstops during that time. He leads shortstops in stolen bases (123), he is second to Derek Jeter in runs scores (341), and he is 21st among shortstops in OPS (.695). TWENTY-FIRST. Andrus provides a solid batting eye (8.4 percent walk rate vs. 13.2 percent strikeout rate) to go along with his solid speed, which allows him to utilize his skills on the base paths to score runs in a very potent offense. While he can get on base and score runs, his defense is where his true value develops. Andrus’ UZR/150 rating is 7.8, fourth among shortstops since 2009 behind Brendan Ryan, J.J. Hardy, and Alexei Ramirez. His .971 fielding percentage is 15th among shortstops since 2009. Of the three players above Andrus in zone fielding who have higher fielding percentages than Andrus, only Alexei Ramirez has a higher OPS. If Ramirez can field better and post better numbers at short, is he worth $15 million or more per season? While he didn’t post numbers close to what Andrus did prior to his age-24 season, he displayed solid gap power, speed, and, of course, impressive defensive skills. 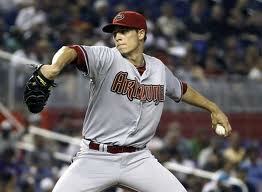 He won his first and only Gold Glove in 2004, posting a .985 fielding percentage and a 3.8 WAR. Is there a whole lot of difference in the abilities of these players, outside of the fact that Andrus’ had four seasons completed prior to his age-24 season, which will be the 2013 season? Certainly, Andrus is better than Izturis, but would anyone have paid Izturis $15 million per season if every one of his seasons had been as solid as his 2004 season? Luis Castillo was an excellent second baseman early in his career for the, then, Florida Marlins. Sure, he wasn’t a shortstop, but he had the same type of skill-set, possibly better, with more speed and on-base skills, while Andrus seems to have more gap power. Once Castillo hurt his feet, though, his 50+ steals potential was also hurt, and he became a 20 stolen base, empty .300-hitting middle infielder. If Andrus gets hurt or loses speed, where is his value? He can’t cover as much ground defensively and his ability to create runs with his legs is gone, as well. Shortstop is a very tough position, but the value of defensive metrics have taken over the player’s ability to help the club in other ways, specifically with their bat. Cal Ripken, Jr., Barry Larkin, Alex Rodriguez, Derek Jeter, Nomar Garciaparra, and Miguel Tejada did a dirty, dirty thing to the position, allowing solid contribution across the board to become a reasonable expectation. Today, only Troy Tulowitzki and Jose Reyes seem like those types of dynamic, offensive-minded shortstops, and for that reason, they appear to be worth exorbitant contracts. The Rangers aren’t the only team that feels that defense is very important, though. When the Cincinnati Reds turned Didi Gregorius and Drew Stubbs into Shin-Soo Choo and Jason Donald in their trade with the Cleveland Indians this offseason, that was one thing, as Choo is a free agent after the 2013 season, but when the Indians flipped Gregorius to the Arizona Diamondbacks with Lars Anderson and Tony Sipp for Matt Albers, Bryan Shaw, and, potential ace, Trevor Bauer, the new value of shortstops in baseball was apparent. Slap-hitting, defensively skilled middle infielders now have quite a bit of value. So, if Gregorius, a career .265/.317/.370 hitter in the minor leagues, had that sort of value, then what is Xander Bogaerts worth? Bogaerts, a Boston Red Sox farm hand, hit .307/.373/.523 with a 4.13 range factor and .959 fielding percentage as a 19-year-old over High-A and Double-A in 2012. Gregorius had a range factor of 3.96 and a .964 fielding percentage as a 22-year-old over Double-A and Triple-A in 2012. Furthermore, if Elvis Andrus is worth an eight-year, $120 million contract, then shouldn’t Troy Tulowitzki fire his agent? His extension for the 2015 to 2020 seasons gives him roughly $19.67 million per season, which isn’t nearly enough considering Andrus can’t carry his compression shorts with cup, since jock straps aren’t used anymore. The good news for Andrus is that he has an opt-out clause after the 2018 season, allowing him to reach free agency during his prime, potentially earning more money if he reaches higher levels of production; however, if he under-performs or gets hurt, the Rangers don’t have an opt-out clause. The question now is: Was this a good contract for the Texas Rangers? With Ian Kinsler signed through 2017 (with a 2018 team option) and Andrus locked up, where does Jurickson Profar go? What if Kinsler has another poor season, as his .749 OPS in 2012 was the worst of his career? Can they trade him? There have been leaks of Kinsler getting moved to left field or first base, but what happen to Mike Olt, another Rangers prospect, who is blocked through 2015 at third (possibly 2016, since Beltre has a vesting option)? Can Kinsler hit enough to play left? 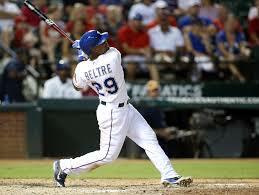 Do the Rangers trade Olt? 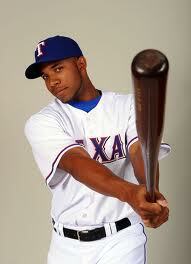 Does Profar move to center even though Leonys Martin is hoping to prove himself there in 2013? Should they trade Profar? The Rangers have committed to defense by signing Andrus and they have committed to spending a lot of money on mediocre offense. After letting Josh Hamilton walk, not addressing their No.5 starter situation this winter, and building excellent talent that they seem to be unwilling to commit to from their minor league system, the Rangers, who have made three straight playoff appearances, seem to have no clear direction to their roster makeup going forward. What If Mike Trout Stumbles? One All-Star Game, One Silver Slugger, One Rookie of the Year, and finishing 2nd in the AL MVP voting, if only because Miguel Cabrera won the first Triple Crown in 45 years, were just icing on the cake for Trout. But…what if this is the peak? What if something happens to hold back his career? An injury, like Tony Conigliaro? A failure to live up to his own hype, like Fred Lynn? When you look at player ratings all over the internet, whether it’s ESPN, CBS Sports, or Sports Illustrated, Mike Trout is right at the top. Is he really a top five player in fantasy baseball? In “real” baseball? Trout’s BABIP was .383. Considering that the “normal” BABIP is .300, this figure is highly inflated. 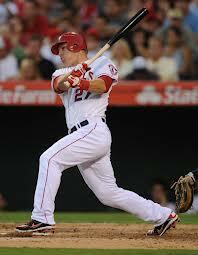 Trout’s strikeout rate was 21.8 percent. When you look at Albert Pujols and his career 9.6 percent career rate, Ryan Braun and his 17.9 percent career rate, Miguel Cabrera and his 17.1 percent career rate, or Josh Hamilton and his 19.7 percent career rate, and you have to wonder if Trout can maintain success if he isn’t getting lucky with where the ball lands (see his inflated BABIP) and he isn’t making contact. Can his speed last a full season and can he stay healthy in a full season, based on how everyone has seen him play? 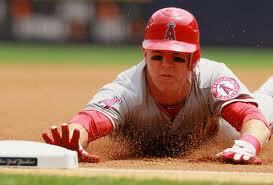 Trout managed 22 infield hits in 2012. If you take those away, due to a leg or foot injury, Trout would have hit .286. Lynn was a tremendous talent, returning to glory in 1979, when he posted a .333/.423/.637 line, with 42 doubles, 39 home runs, and 122 RBI for Boston, but prior to that, he regressed significantly from his rookie year production. Fred Lynn never lived up to the hype that he created in his dynamic rookie season, despite being a very productive player, being eliminated from the Hall of Fame ballot after his second year of eligibility, after receiving just 4.7 percent of the vote in 1997. .325/.402/.564 with 122 runs, 30 home runs, 87 RBI, and 53 stolen bases, while maintaining an inflated .379 BABIP. Ryan Braun, Albert Pujols, Miguel Cabrera, Josh Hamilton, Derek Jeter, and Robinson Cano should be expected to maintain their career norms, but fantasy baseball players could be making a huge mistake by taking Trout 1st overall in 2013. While the skills and tools are there for the 21-year-old to continue thriving and become a future Hall of Famer, he will need to repeat his 2012 numbers for several seasons before being labeled the top player in baseball. Is he the most exciting player in baseball…absolutely. Should everyone subscribe to MLB.TV to have an opportunity to tune in a few times per season…definitely. Are we asking too much for a 21-year-old to become the face of an entire league…without question.